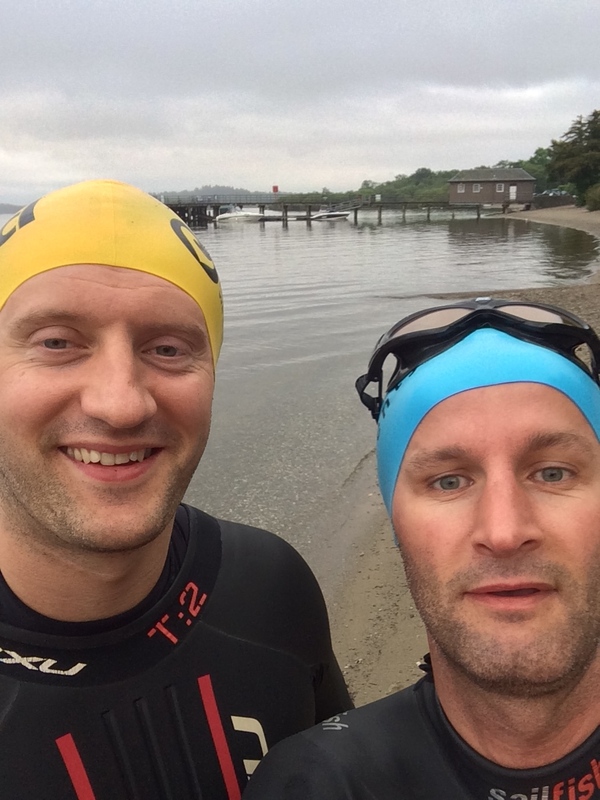 “Do you fancy giving the Luss to Balloch swim a try on Sunday big man?” were the words that came out of my mouth as i spoke to Big Chris on the phone, he didn’t answer but i could sense the smile rowing across his face. Last year as i have written in one of my first blogs (Blind leading the Blind) we attempted the Luss to Balloch swim, we were successful but for some reason we went the wrong way and had a slight detour the wrong side of the island of Inchmurrin, it was agreed that Chris and i would meet at Balloch Car Park at 5.40am and leave a car there before taking the other one up to Luss. We arrived at Luss to a peaceful, calm but damp morning, we were on our own apart from the midgies who came out in their millions to send us off, I am a magnet for midges and at this moment i am covered in bites form this 10 minutes exposed. Wet suits on, my orange Buoy filled with food and into the water we went, not before the mandatory selfies featured above with Luss pier on the background. The first leg was like being the first person of the day to enter the swimming pool, the water was so calm, the shelter that is given by the Islands around Luss (please note that the Mapmyrun image above doesn’t show these islands, but if you check on googlemaps you will see a number of smaller islands around this area) is brilliant for swimming, the first 3 miles were so peaceful, not having to worry about balancing against any waves, just relaxing into autopilot to ease through the water. The Big Man and I got into our usual mode of approx 3kph, just under the pace of 2mph and glided through the calm waters taking in the scenery, a truly stunning part of the world. Once we reached the Golf Course when met with the Loch as we more regularly experience her, the geography of the Loch changes, no more shelter from the islands, the Loch open up as we spot out next target point – the most southerly tip of Inchmurrin. Once the Loch opens up you can always expect choppier waters and the Lady of the Loch obliged. This chop wasn’t as bad as the week before but the angle of these waves was a challenge. I find it easier swimming directly into the waves, however these were side on and when you get side on waves its the equivalent of a decent core session at the gym as you fight to stay balanced in your stroke. Once we reached the point at Inchurrin, we took the pre planned break 5 miles into the swim. Within the highly visible orange Buoy that i volunteered Big Chris to pull today we fuelled up with energy bars and flat coke. I was noticeably shivering and we probably cut short this view point to get moving again before my chill became any worse. Looking back the coldest part of the swim that day was the preceding leg over to this point, and i also feel as though i learnt that we should have had another gel before we commenced that leg. Into the final 3 miles to Balloch and we both felt brilliant at this stage, this stretch of water is usually notorious for the chop as you need to fight the waves for the first 1.5 mile to more sheltered waters however not only did we find calm waters we also found much warmer waters. This is difficult to explain and maybe someone scan explain it to me but across the whole swim we must have experience changes of 2-3 degrees, if not more. Increases in temperatures for a short period of time can often be alarming especially when you are following someone!!! Half way home and we started to notice more traffic on the Loch and this is the main concern for safety. Luckily enough the big man and me are OK at spotting these potential issues and some of them are a pleasure. What a pleasure it is to say that were were swimming in Loch Lomond when the sea plane took off (then landed 30 minutes later) right next to us giving us a perspective not may people are able to enjoy. A bit further down the Loch and busier still, we notice a speedboat and a jet ski heading straight for us, this is where we know that the orange buoy that we drag along works well, however these two were having a race in the distance. We stopped and started waving the orange Buoy in the air and they noticed us just in time and came for a chat. 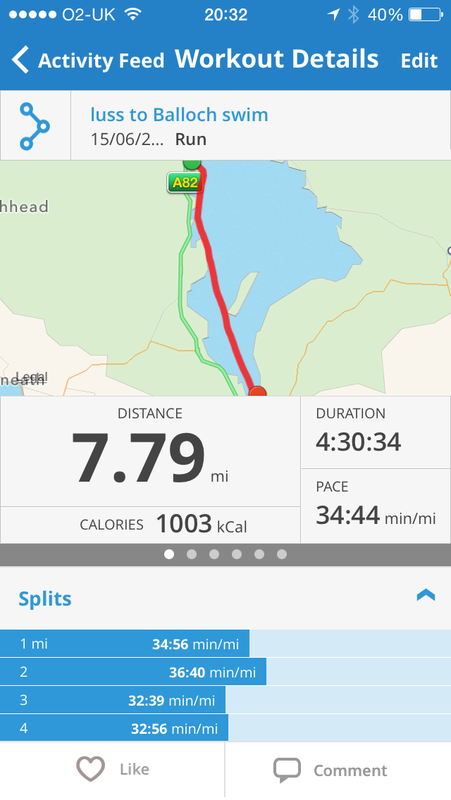 This entry was posted in Uncategorized and tagged endurance, Ironman, loch lomond, open water swimming, sport. Bookmark the permalink. IronmanStefan on Midge and Pike!! Murray McMillan on Swim or Sin? The start line = 24 miles to swim.